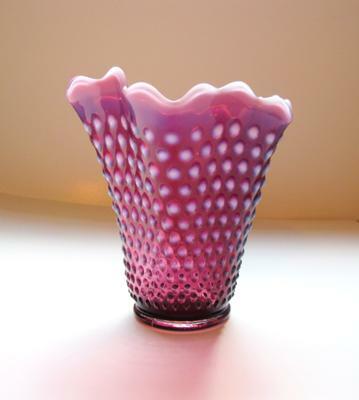 Beautiful Opalescent Hobnail Cranberry Glass Vase but who was the maker? This piece of Cranberry Glass belongs to my daughter in law. It was given to her by her mother who had gotten it from her great aunt who was born in the late 1800s in Ohio. There is a mark on the bottom of the glass but I can’t identify it. I’ve looked all over the web but have never found a vase like it. 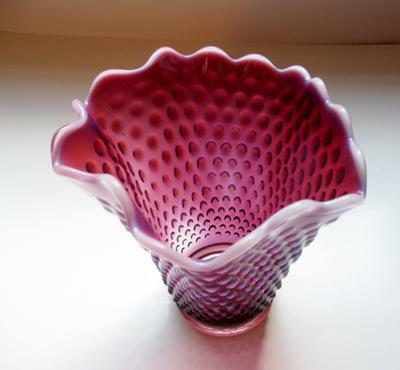 All the hobnail cranberry glass I’ve seen is very symmetrical whereas this one is free form. 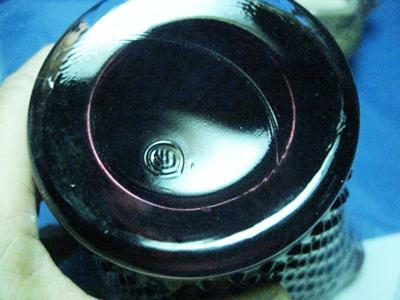 Very few examples of cranberry glass seem to have a makers mark. We’d love to know anything about the glass and the mark. It is a hankerchief design cranberry glass vase by Fenton, pre-logo year early 1970’s. 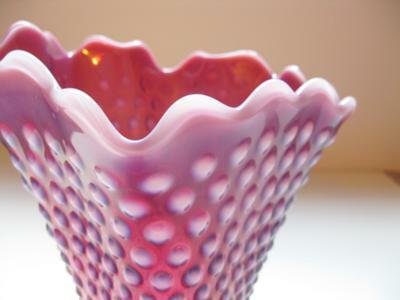 So, Fenton Cranberry hobnail vase is the answer.